For a long time now I have been wondering why so many accidents in Thailand have been suggested as being caused by brake failure. Well the one thing I did know was that there is 2 different brake fluids and lwanted Dot4 to do a repair job at home. At this time and. I have to point out that the 2types of brake fluid are Dot3 and Dot4. Dot3 is perfectly satisfactory for motorcycles especially small scooters. Some time ago now it was found that with the emergence of large trucks and Big heavy cars and pickups Dot3was overheating and causing brakes to fail so came the birth of Dot4,and as I have said l wanted Dot4 so l was not just surprised but quite horrified to find that out of 5 major new car suppliers only1 in the whole of Udon Thani could supply me with Dot4 and the others seemed to be surprised that I was making such a scene about it. I am also surprised that nobody has picked this up. Especially as most of the vehicles involved seem to be Buses, large trucks and other big vehicles. Anybody else got any thoughts on this? You will notice this is an initial statement made by reporters prior to discovery of facts or any actual investigation. No official causal statistics are ever given to substantiate this assumption. Consequently, the DOT 5.1 brake fluids level was created to differentiate these two very different chemistries which both meet DOT 5 brake fluids performance requirements. I have no data for dot 3 or 4, but somebody out there has, however HGV, large passenger carring vehicles would in the main have air assistance, the brake failure cry is used by many to inexpirienced police officers at the scene of an incident and it looks like it works everytime,. souls aboard down an incline holding the brake in all the way, disaster is very near, brake fade is the commen denominator of many Thai incidents with large vehicles, now go down the same incline check braking in a low gear and different outcome, sorry to all who understand this phenomenon, now try explaining that to a proffesional thai driver, it will not take you long because they will tell you there brakes are fine all the time it is only a problem when people stop quick in front !!!! That is true. Air pressure usually held at 120 PSI by the governor. 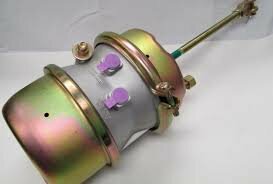 As air is used, in a brake application, governor kicks in and replaces lost air. In the West spring brakes are mandatory - if brake system air pressure lost, a spring applied the brakes. You must build up air pressure before the brakes will release again. But not mandatory here - seen many trucks with single chamber brake pots. One major change that would be of great help here in LOS is if trucks were equipped with Jake Brakes - never heard of them in all my time here. Rule of Thumb - if, when stopped behind another car, you can see where his rear tires touch the road, you have room to turn from behind him and pass to either side. With tegard to the Buffalo incident, disgusting. 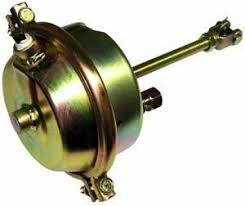 Jake brakes are an engine brake primarily fitted to US truck engines which are not common in the Thai market. The Japanese trucks use exhaust brakes which behave similarly although not quite as effective. The dual chamber actuators are part of full air / maxi brakes. Most heavy trucks use maxi brakes but some medium trucks and buses still use air over hydraulic brakes. The spring applied design makes Maxi brakes superior, but they can still fail if not maintained properly. Poor truck maintenance standards are easy to find in Thailand, as is overloading and poor driving standards. There many accidents attributed to heavy vehicle brake failure. Would be interesting to know how many were caused by brake system failure to operate correctly compared to cases where the brakes failed to stop the vehicle because they were misused (overheated, applied too late or at excessive speed etc). My hobby is watching car and scooter crash videos from Thailand. Go check it out out on YouTube. I'll estimate 40% of all accidents are collisions BEFORE the Thai hits the brakes.